retain Ariel. Owner Schulman already felt that way. jumping ability for Schulman's Universal Gym Equipment com- championship'," Ariel said. - pany. who was an engineering student in college. with the team's general manager, coach and, player personnel	"Halas is crazy ovgr this - he went berserk," Ariel recalled. showed the engineering factors in shooting jump shots and free lessened the shock as the 82 year old moves about. throws. He tried to explain that the wrist flick (follow through) With the Cowboys, Ariel helped improve offensive lineman was really not that important to the mechanics of the shot and Rayfield Wright's knee injury and analyzed the team kickers. how to study the angle of release of the shot. Smith, the 7-foot center, who was with the Los Angeles Lakers at percent. his feet and was constantly off-balance. For this and other corrective work he has done through foot behind the puck. r. computer study, it is evident why one of the major shoe He studied some of Seattle Slew's races and noticed that th companies (Pony) retained Ariel to design one of Its new . horse's legs were running at different angles when he final products. After hearing the 11/2 -hour presentation, Furtado was clearly impressed. 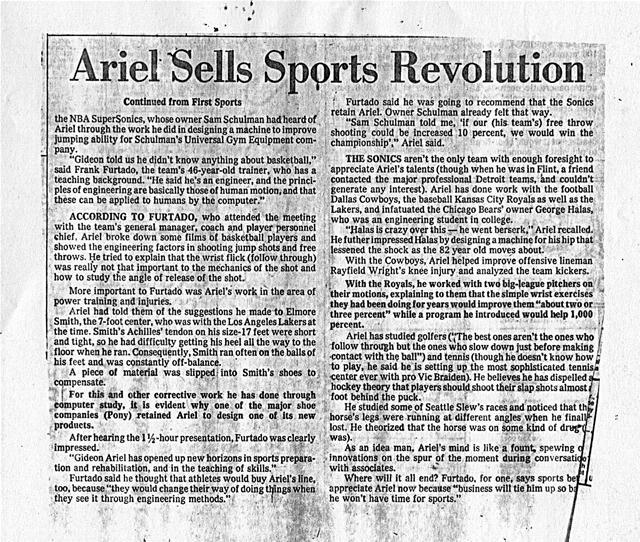 "Gideon Ariel has opened up new horizons in sports preparation and rehabilitation, and in the teaching of skills." lost. He theorized that the horse was on some kind of drub,' was). Where will it all end? Furtado, for one, says sports be appreciate Ariel now because "business will tie him up so b he won't have time for sports." Generated on 4/20/2019 4:07:29 PM (PST) ADI/HQ/GBA/2019/ARIELCLOUD/v3.0.2018.0126.